Chicago based Cool Bear Studios today announces Cosmic Top 2.0.0, a major update to the toy top that buzzes with sci-fi sounds and glows with limitless, colorful shapes. 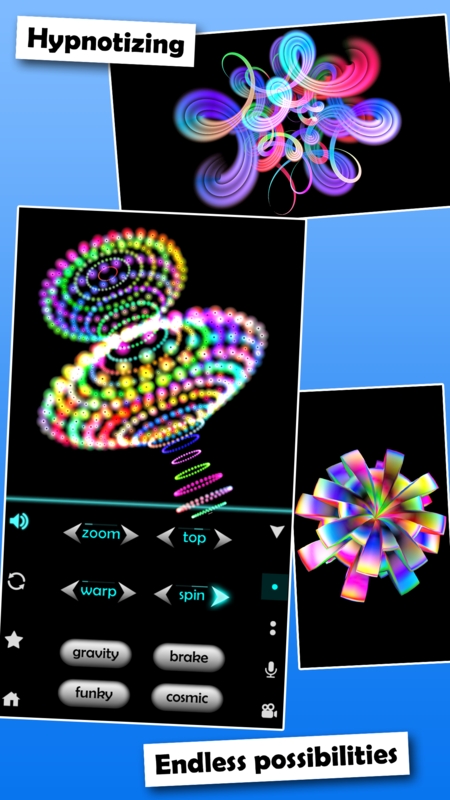 Cosmic Top is an audiovisual physics-based simulation of a spinning, wobbling, and morphing top. The new version brings redesigned graphics and audio engines, the power to record spin and tumble sounds that play back in sync with the top's motion, and the capability to record and share video of the top's action. [prMac.com] Chicago, Illinois - Cool Bear Studios today is pleased to announce the release and immediate availability of Cosmic Top 2.0.0, an update concluding over two years of development and packed with new features for the toy top that buzzes with sci-fi sounds and glows with limitless, colorful shapes. The brand new Cosmic Top brings a totally redesigned graphics engine with new and updated top styles that flow with color and iridescence. The 3D audio engine has been re-engineered and now offers echo and Doppler effects that can be experienced in full stereo with the sound being more tightly integrated with the top's physics. Simple slider controls allow editing of echo delay and decay effects, the speed of flowing color, and ratio of the top's spin and tumble inertias. Support for Inter-App Audio has been added. The new feature we think users will find the most entertaining is the ability to record spin and tumble sounds for up to a minute each from the microphone, and then hear both tracks played back simultaneously and in synchronization with the rotational motion of the top. This means recorded speech can be transformed into sounding like a high-pitched talking chipmunk or a low-pitched growl from a scary monster. The creative possibilities are endless. The sound of flicking a finger against an ordinary glass can be reshaped to sound like orchestral wind chimes. The spin soundtrack can even be played backwards. What better way is there to share the experience than with video? Want to create a funny or spooky sounding video message with crazy color? Cosmic Top now permits the creation of up to one minute of high quality video of the top's action and sound that is saved to the device's photo library where it can be then be shared. Cosmic Top was named one of the best iPhone Entertainment apps in the US and 8 other countries by App Store Rewind 2011. Cosmic Top 2.0.0 is $1.99 (USD) and available worldwide exclusively through the App Store in the Entertainment category. Review copies are available upon request. Cool Bear Studio LLC was founded in Chicago, Illinois, in 2010 by James Abbey and Mike Anderson. Copyright (C) 2010-2016 Cool Bear Studios LLC. All Rights Reserved. Apple, the Apple logo, iPhone, iPad, and iPod touch are registered trademarks of Apple Inc. in the U.S. and/or other countries. App Store is a service mark of Apple Inc.